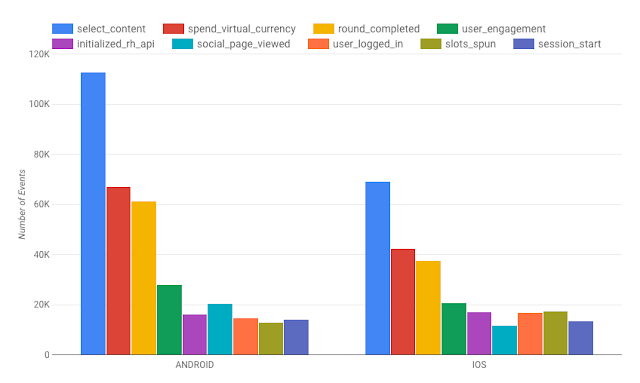 This entry was posted in Google Developers Blog and tagged bigquery, cloud, Firebase, Firebase Analytics on September 30, 2016 by Google Devs. Today, Kubernetes 1.4 is available to all Google Container Engine customers. In addition to all the new features Kubernetes 1.4 — including multi-cluster federation, simplified setup and one-command install for popular workloads like MySQL, MariaDB and Jenkins — we’ve also taken big steps to make Google Cloud Platform (GCP) the best place to run your Kubernetes workloads. One-click alpha clusters can be spun up as easily as a regular cluster, so testing Kubernetes’ alpha features like persistent application support is a one-click operation. Support for AppArmor in the base image gives applications deployed to Container Engine multiple layers of defense-in-depth. Integration with Kubernetes Cluster Federation allows you to add a Container Engine cluster to your existing federation, greatly simplifying cloud bursting and multi-cloud deployments. Rich support for Google Cloud Identity & Access Management allows you to manage GKE clusters with the same multi-faceted roles you use across your GCP projects. A new Google Container-VM Image makes upgrading a breeze and allows new upgrades to be automatically installed with a simple reboot. Monitoring of all cluster add-ons ensures that all key functions for your cluster are available and ready to use — one less thing to think about when running a large distributed application. Niantic - creators of the global phenomenon Pokémon GO, relies on Container Engine to power their extraordinary growth. Philips - smart connected lighting system Hue, receives 200 million transactions a day that are easily handled by Container Engine. Google Cloud ML - the new Cloud Machine Learning service from GCP is also running fully on Container Engine. And many more companies, from Box to Pearson, are choosing Kubernetes to manage their production workloads. As always, if you’d like to help shape the future of Kubernetes, please participate in the Kubernetes community; we’d love to have you! Please join the google-containers mailing list or on the kubernetes-users or google-containers Slack channels. Finally, if you’ve never tried GCP before, getting started is easy. Sign up for your free trial here. This entry was posted in Google Cloud Platform Blog and tagged Google Cloud Platform on September 30, 2016 by GCP Team. This spring, we announced Container-VM Image as a beta product under Google Cloud Platform (GCP). If you're a developer interested in deploying your application or a service provider on Google Compute Engine, we recommend taking a few moments to understand how it can help you. Linux containers help developers to focus on their application without worrying about the underlying infrastructure. A secure and up-to-date base image is a critical building block of any container-based infrastructure. Container-VM Image represents the best practices we here at Google have learned over the past decade running containers at scale. Container-VM Image is designed from the ground up to be a modern operating system for running containers on GCP. Read on for more information about the design choices behind Container-VM Image and its attributes. Container-VM Image is based on the open-source Chromium OS project. Chromium OS is a reliable and vetted source code base for this new operating system. In addition, its allows us to use the powerful build and test infrastructure built by the ChromeOS team. The Docker container runtime is pre-installed on Container-VM Image. A key feature of containers is that the software dependencies can be packaged in the container image along with the application. With this in mind, Container-VM Image’s root file system is kept to a minimum by only including the software that's necessary to run containers. Container-VM Image is designed with security in mind, rather than as an afterthought. The minimal root file system keeps the attack surface small. The root file system is mounted as read-only, and its integrity is verified by the kernel during boot up. Such hardening features make it difficult for attackers to permanently exploit the system. Having full control over the build infrastructure combined with a minimal root file system allows us to patch vulnerabilities and ship updated software versions very quickly. Container-VM Image also ships with an optional “in-place update” feature that allows users to stay up-to-date with minimal manual intervention. Note: All new Container-VM Images have “gci-” prefix in their names. You can also start an instance using Cloud-Config, the primary API for configuring an instance running Container-VM Image. You can create users, configure firewalls, start Docker containers and even run arbitrary commands required to configure your instance from the Cloud-Config file. We're working hard on improving and adding new features to Container-VM Image to make it the best way to run containers on GCP. Stay tuned for future blogs and announcements. In the meantime, you can find more documentation and examples at the Container-VM Image homepage, and send us your feedback at google-containers@google.com . This entry was posted in YouTube Blogs, YouTube Creators and tagged YouTube on September 30, 2016 by YT Creators. In our latest update, Google Maps teams up with Google Calendar to make it even easier to get where you need to go. Starting today, Android users worldwide will start to see their Google Calendar events on Google Maps. So whether you're heading to a family dinner or getting subway directions to a birthday party, you can now quickly and easily access your events directly from the map. Seeing your Google Calendar events on Google Maps is the newest way to save time and make the most of every day. Here's a list of existing Google Maps features that help you personalize your experience by surfacing important information where it matters most. A lot of trips start or end from home and work, so save your home and work addresses to get directions in seconds. You can also add a little flair to your map by using your favorite sticker to mark home and work on the map. Search for “Home” in Google Maps or open “Your Places” to get started. Want to be able to simply say “OK Google, navigate to daycare?” You can. Just open Google Maps, search for the address you want to label, press the label button, and enter a name. The next time you type the name into the search box in Google Maps, your label will be a suggested result. 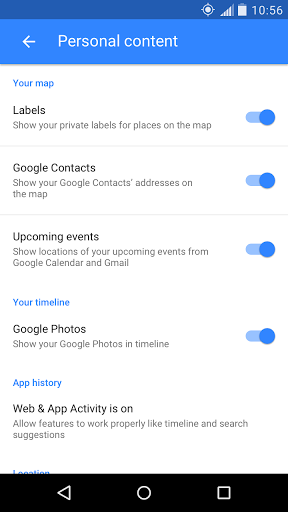 Your Google contacts will appear on Google Maps as well. Rather than memorizing your coworker or cousin’s address, you can get directions by typing their name in the search box (as long as you have an address attached to their contact info). To manage all your personal content and how it appears on Google Maps, you can use the new personal content manager under the settings tab in the side menu. Simply toggle off what you don’t want to show and toggle on what’s most helpful to you. This entry was posted in Google LatLong Blog and tagged calendar, LatLong, Maps on September 30, 2016 by Zach Maier. This entry was posted in Official Google Blog and tagged calendar, Maps on September 30, 2016 by Zach Maier. This entry was posted in Google Chrome Releases and tagged Beta updates, Chrome OS, Google Chrome on September 30, 2016 by Bernie Thompson. This entry was posted in Google Chrome Releases and tagged Chrome OS, Google Chrome, Stable updates on September 30, 2016 by Ketaki Deshpande. This entry was posted in Google Chrome Releases and tagged Chrome OS, Dev updates, Google Chrome on September 30, 2016 by Bernie Thompson. This entry was posted in Research Blog and tagged Computer Vision, datasets, machine learning, Research on September 30, 2016 by Research Blog.